The faucet’s open, and here we go. You don’t need to be in the backcountry to know it, you can feel the pulse on Elk Avenue and seeing the lines build up at the 4-way. 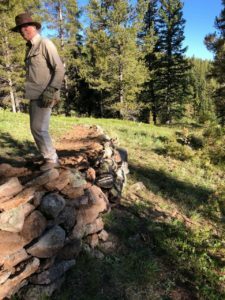 So far the backyard is holding up nicely, and huge props to the USFS – Gunnison Ranger District for getting on top of the dispersed camping issues. It’s amazing what designating spots does to help ease the camping impacts out there, and even a Sunday at Irwin campground and the surrounding area seemed neat, orderly, and had well distributed use. More camping infrastructure is on the way from the FS and it’s only going to help. Port-o-pots are out in the high use areas thanks to the USFS, Chamber of Commerce, and the many businesses and entities that helped support and it seems that the whole community is rallying behind the idea of being out in front of the masses and providing the infrastructure needed for our heavy tourism base. That’s awesome! This time the big catch is the BOAT! Yeah… a BOAT! On Gothic Road, just before Emerald Lake, a distressed and perhaps desperate individual had a helluva time last November trying to make his way to Buena Vista via Schofield Pass and the Devil’s Punchbowl. You hear what I’m laying down!!! Word is our friend was no friend of the law and he certainly miscalculated his trajectory, which eventually led him right into the hands of the law. But he left his boat and trailer for us to grab, and grab it we did. We love collecting the big stuff from our backyard, but we wish we didn’t have to. Granted it seems our big ticket items usually get left in the Fall. We’re glad to get them each Spring. 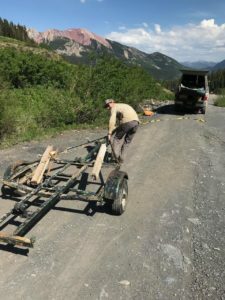 Crested Butte Conservation Corps crews have been all over the North End of the Valley and have been getting further south to work alongside Gunnison Trails crews on Roaring Judy and Dr. Park. We were glad to have Gunnison Trails join us on Baxter Gulch. Speaking of Baxter Gulch… the Barn has been RAISED! It’s almost bittersweet to think of the years of work and efforts on this amazing trail, and it was truly a community effort that our good friend Ian Hatchett likened to a barn raising. 6.0 miles of track have been realized and we’ve finally connected to Carbon Creek thanks to the CBCC putting the final touches on this gem. More work will always need to be done, but the loop, the access, and the joy this trail is already bringing is testament to the power of recreation and the amazing trail amenities this place is home to. 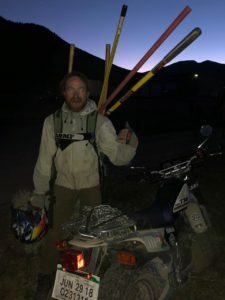 There are so many thanks to be given, but the Town of Crested Butte, the CB Land Trust, and the estimated 8,250+ wo/man hours to put the trail in since 2011are so very commendable and deserve mad credit. 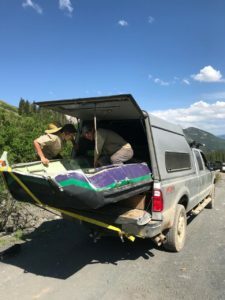 Many of those hours were Western Colorado Conservation Corps hours, many of them were CBMBA led volunteer hours, with CBCC hours in there facilitating and filling in the work. It takes a village! 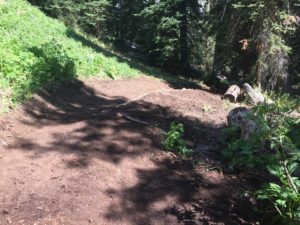 Forest Service trail crews have done amazing work on Block and Tackle and are now working again on Carbon Creek Trail #436. CBCC crews cut out 401 and 403 and got ahead of water issues out there before heavy use. Signs are up at the start of 403 to remind folks of the private property there at the start and to respect the parking area and trail access. 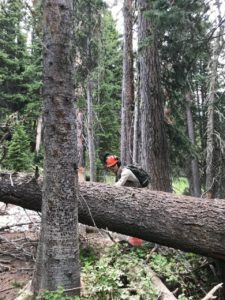 Crews got out on the Scarp Ridge Trail and worked on the connection from Emerald Lake to Gothic Road. 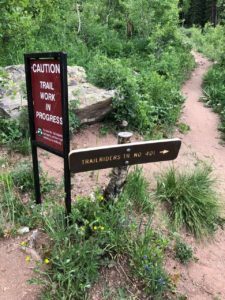 Teocalli Ridge, the Budd Trail, the Dyke Trail, Cliff Creek, the Wagon trail, Deer Creek, Snodgrass, Strawberry Trail (402), and the Woods Walk (w/ CB Devo and CB Land Trust) have all seen recent work and are in better shape. 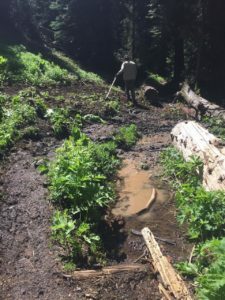 Crews will now shift to more stewardship work with the bigger numbers coming, and you will see them more so at trailheads and more congested areas. 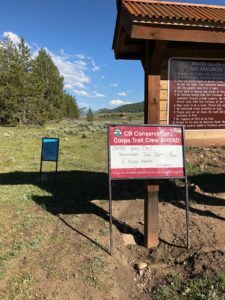 They will provide user information, help park cars at busy trailheads, continue to clean up trailheads and camping areas, and help reduce user conflicts on busy backcountry roads. We aim to help the ranching community when livestock come into the high country, and we’ll respond to the community feedback we get for wherever and whatever we can help with out there. The good news about the low snow, low water year… the Slate River is seeing less impacts with the water too low to paddle board from Gunsight Bridge anymore. Granted, when CBCC crew leader Nick Catmur spent a Saturday out there in early June, we realized the same entitlement we see with bike riders when upper 401 is not yet ready for users. You can stand there and educate people that the water is low, they’ll be trespassing, they’ll be impacting a heron rookery, but hot damn, that’s what they came here to do and they are going to do it anyway. The entitlement issue is our biggest foe, and we’re doing all we can to help change that paradigm. That also, takes a village. The bad news… a Stage 2 fire ban is fully in effect and the fear is it could increase to Stage 3 with no sign of monsoon rains in sight. 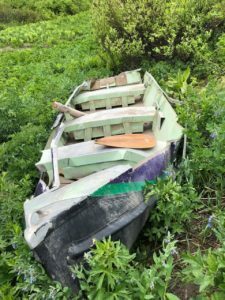 CBCC crews will be doing their best to help educate users about the bans, but it’s up to us individuals to make sure we are heeding the regulations and know the rules. Heavy fines will follow any unauthorized uses, and all the regulations can be found on the Forest Service website.